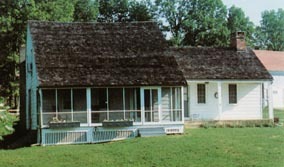 The Eleazer Harding House is managed by the Mount Hope Historical Society. Admission is by donation. Museum hours: 12 noon - 4 p.m. the fourth Sunday, May through October, or by special appointment. 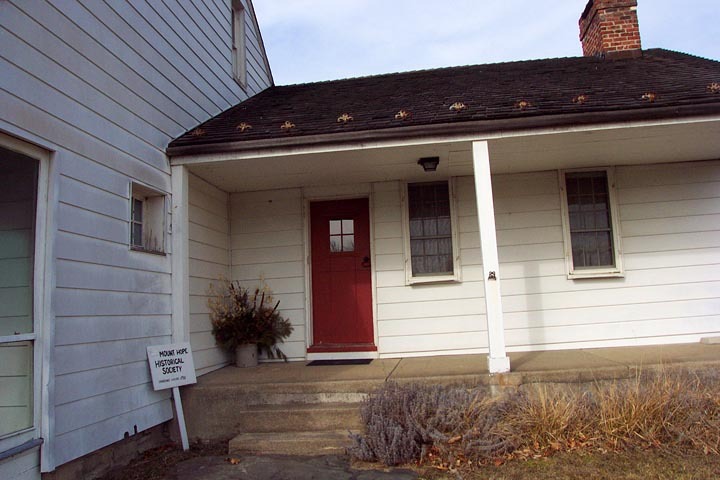 The Mount Hope Historian is available at the house Tuesdays, from 1 p.m. to 3 p.m., year round. "Craftspeople and tradesmen display early skills such as basketmaking, spinning, blacksmithing, hearth cooking, cidermaking, sheepshearing." 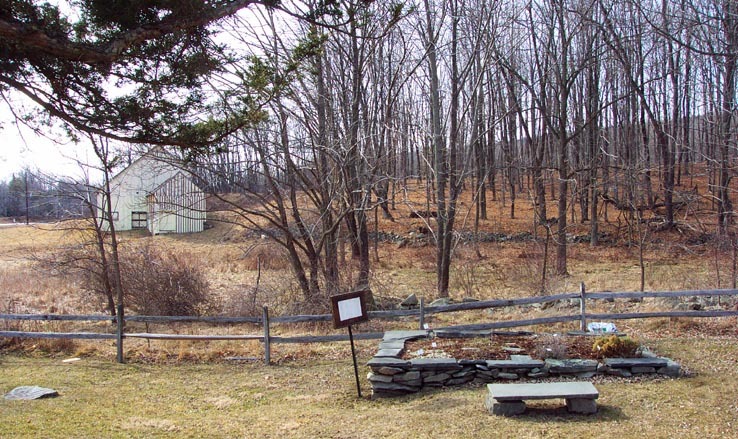 There is a Medicinal Herb Garden where you are invited to touch and sniff , and a carved stone horse trough used long ago in Otisville. 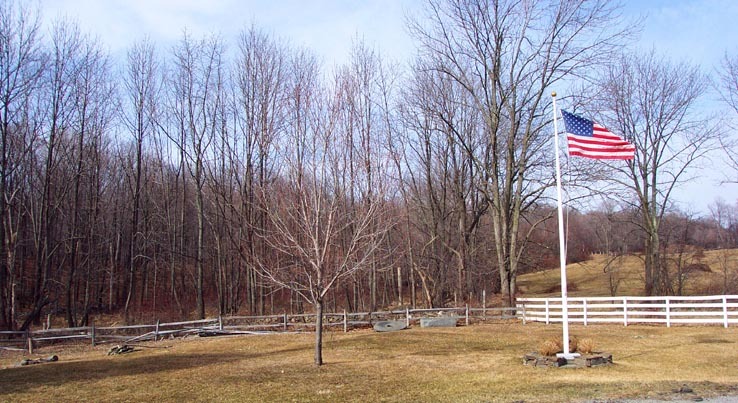 Behind the flag, which is a memorial to one of the workers who helped restore this home, you can see the trough in the background, and to the right of the stone horse trough is the stone wheel form, used to make wheels. North Front Door This pictures shows the entrance, not used, and displays a portion of the beautifully restored wood shake roof, which has no sheathing beneath, and is weather tight. I viewed the underside of the roof from the attic, which has beams that still bear their bark and stubs from branches. The beams have butted joints, and wooden pins/pegs in some places. Rocking Chair Porch This is the porch you enter through, beautifully restored. The warmth and charm of this accurately restored home begins to beckon you. Barn, South side of property This barn and its property will soon become a part of the restoration of this property. Behind the barn, you can barely see the black, bob-tailed cat that I was watching. 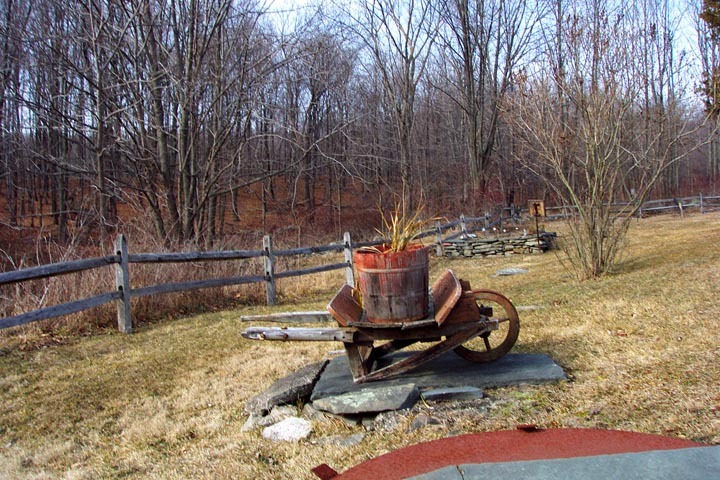 Old farm wheelbarrow in side yard; you can see the Medicinal herb garden in the rear. The plantings include yarrow, tansey, thyme, bergamot, lovage, sorrel, and several other herbs. The garden was planted by a group of local boy scouts as one of their projects. 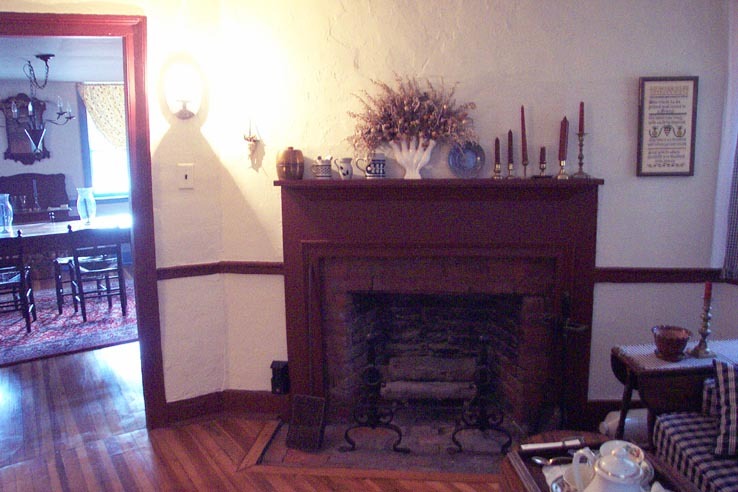 The main front room Upon entering the home, to your left is this beautifully restored room. 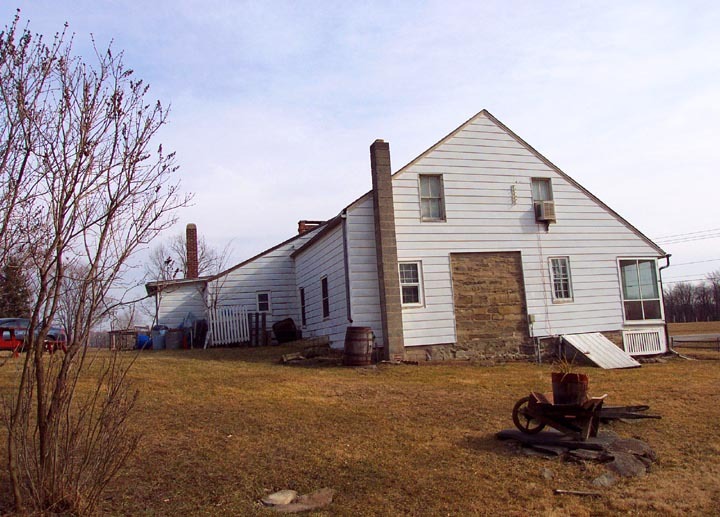 Shown here is the lady responsible for saving the house from a razing, and too, responsible for restoring the property, along with a few volunteers, and some hired specialists. 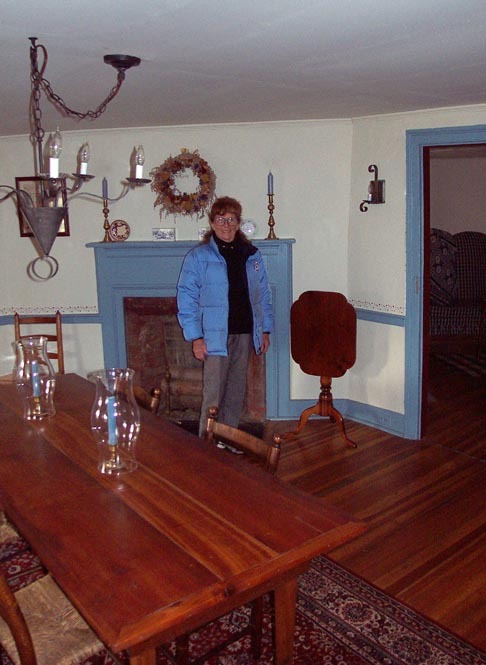 Dolores Mundy Hawkins [shown] accomplished wonders, accurately restoring and furnishing the property. Corner cupboard from the Woodward Mapes homes. 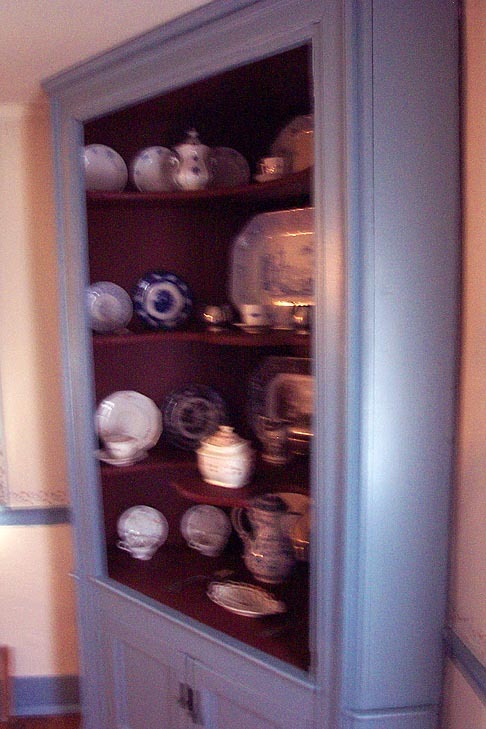 The cupboard, not original to this home, but of the period, was 16" too tall to fit here. With much skill and I'm sure angst, Dolores and her carpenter were able to pare it down to fit. This cupboard was originally in the Woodward Mapes home property, a now deserted farm on Tally Ho Road in Mt. Hope, soon to be burned, subdivided and developed. The cupboard was rescued from the now empty home, by a former owner, for this property. A side view of the cupboard. Historian/Curator's Office All of the plaster work in the house was done by hand, by Dolores and a helper. 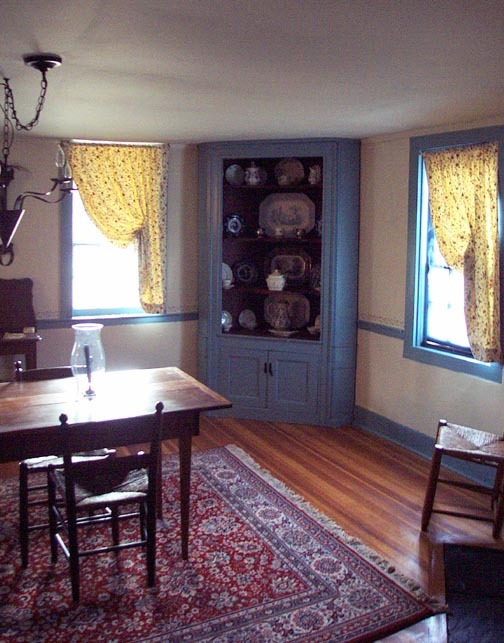 The room holds a desk, small "couch", a beautiful hand woven rug, and other period pieces. The Hearth Room Originally, the home was a one room home, and this was the room. 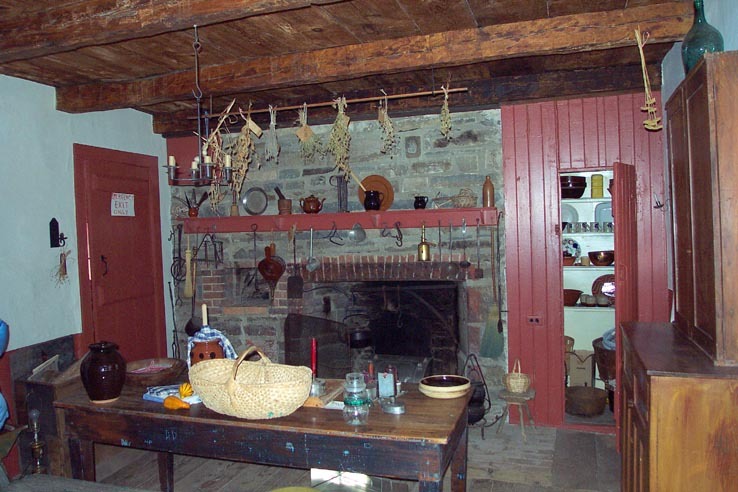 The hearth is still used for cooking - it holds all of the original, or reproduced implements needed, along with a working beehive oven, and a couple of hearth ovens, which are placed before the fire. Many of the utensils are original, and some were hand crafted for this room. In the far left, top corner is the powder cupboard (gun powder). You won't want to leave this room - the feeling is warm and cozy, waiting for the lady of the house to appear. 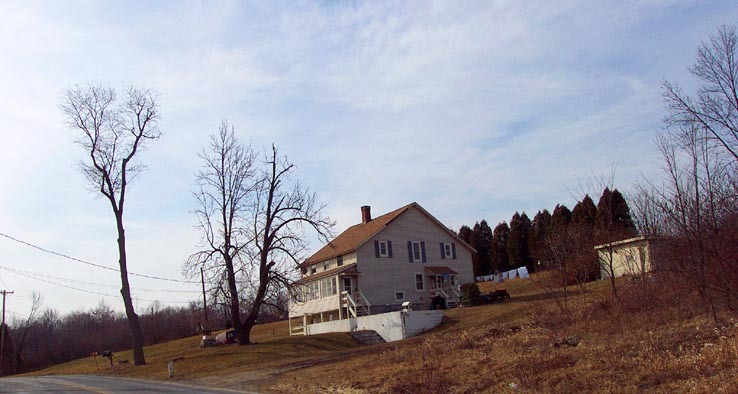 Erastus Mapes farm This is not on the property, but rather on Tally Ho Road in Mount Hope. Privately owned, It is still, obviously, in use today. 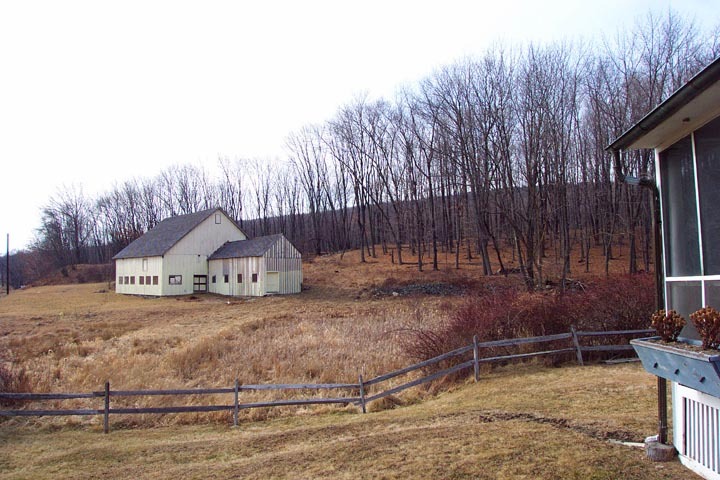 I hope you enjoyed this brief visit to a beautiful treasure in Mount Hope, Orange County, New York. I did.